My favorite film of 2017 was the re-adaptation of the classic Stephen King novel IT. Starring Bill Skarsgard as the creepy, evil clown Pennywise, the film proved - once again - that a great story can be worth revisiting. 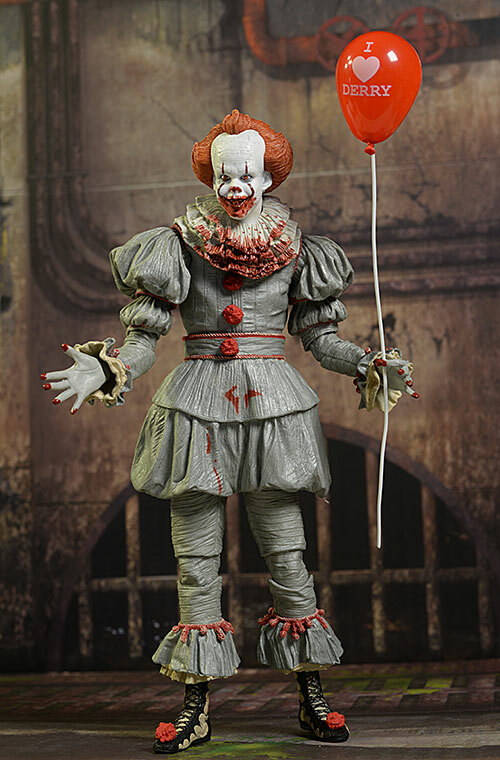 NECA is doing action figures based on the Pennywise of old and the Pennywise from the new film. 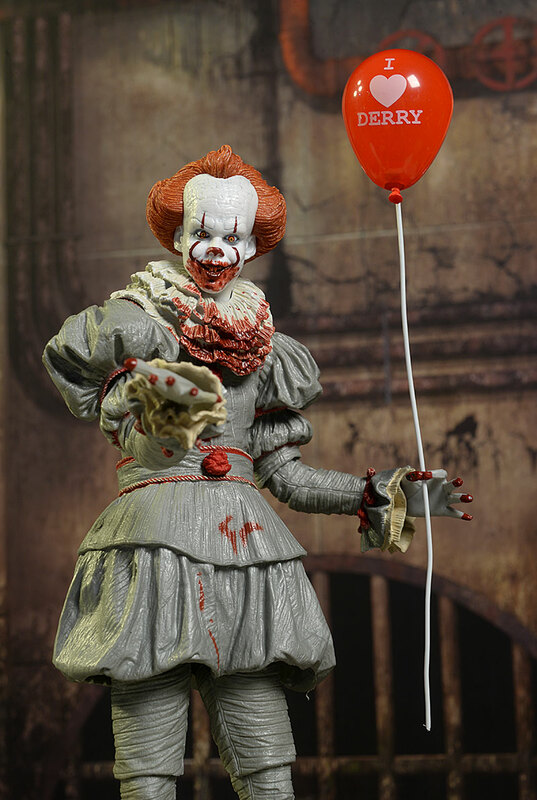 The first released version was at SDCC last month, where a bloody Ultimate version of the new Pennywise debuted. Didn't make it to SDCC? No problem, because it was also a GameStop exclusive, which is where I picked up mine. This is the version I'll be reviewing tonight. 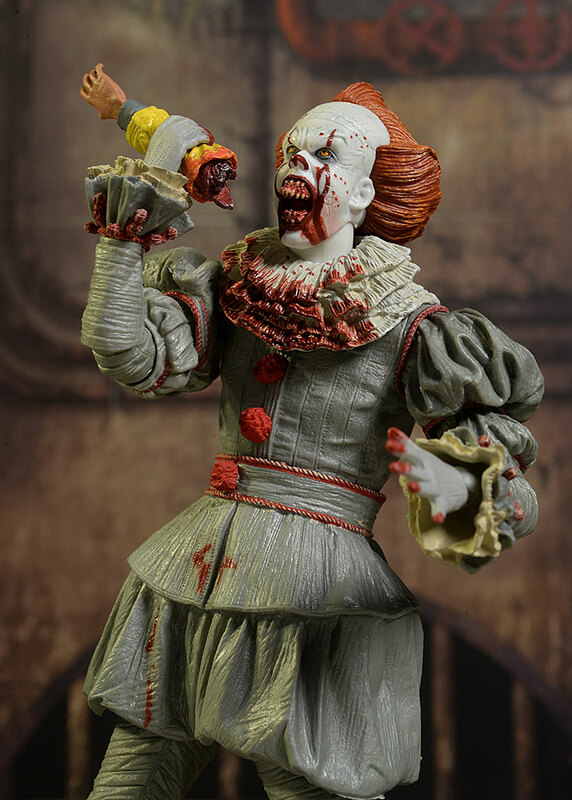 There's also a non bloody Ultimate version, which actually has more accessories than this one, and there's an Ultimate version of the 1990 Pennywise coming soon as well. 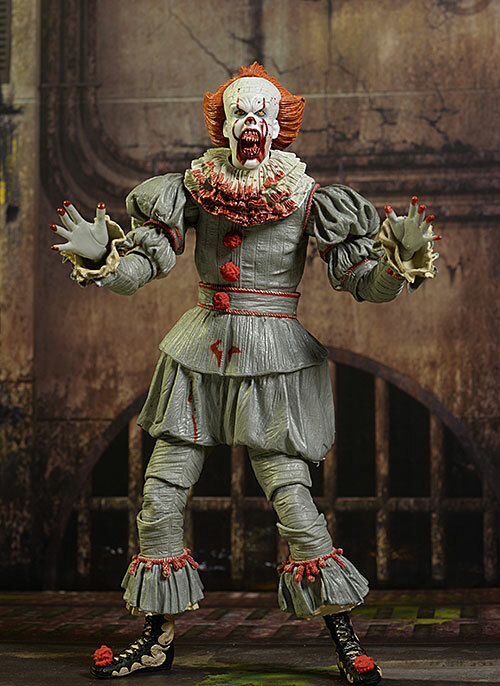 The non-bloody modern Pennywise is on its way to my doorstep, and once I have him I may cover him too, since the difference in accessories and paint may make it worthwhile. This guy is $35 at Gamestop, while the non-exclusive version is closer to $27 depending on the retailer. This is a pretty cool box, with a large, lenticular cover. 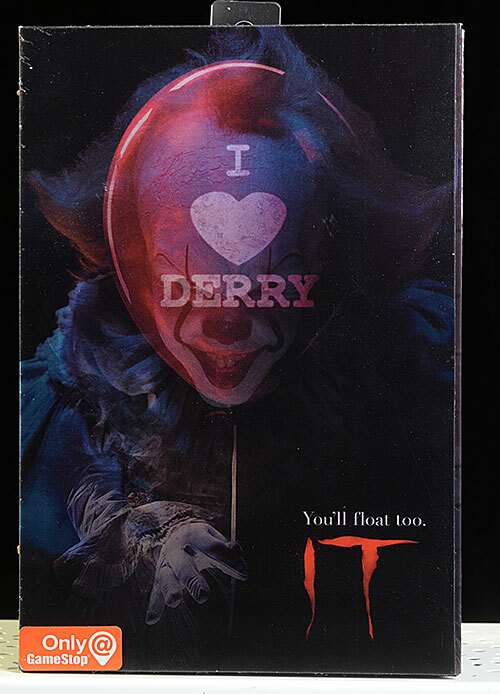 Turn it one way, you see the "I love Derry" balloon...turn it the other, and there's Pennywise. Hold it just right, and you can see him through the balloon, which is a really cool effect. It's fairly collector friendly too, with just one twisty tie holding the figure in the plastic tray. I really like the sculpt here on both portraits and the body. 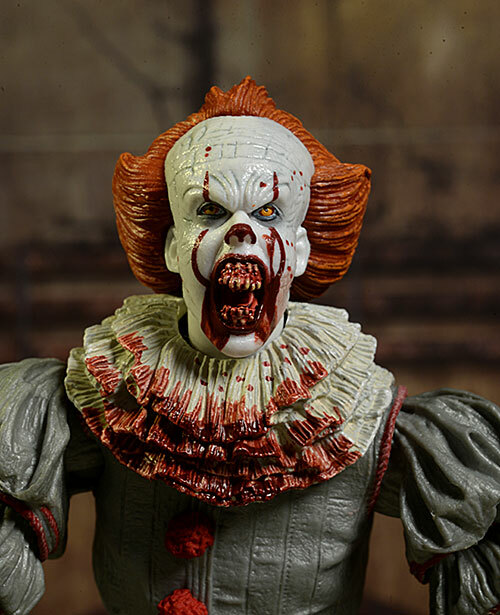 One of the reasons I may do a review of the regular version as well is because the bloody paint work on the 'normal' face hides one of his best sculpted features - his teeth. Those buck teeth are there, and the sly smile and textured skin look great. The wide eyes are slightly innocent...but only slightly. The hair has excellent stranding and detail, and the overall textures, especially on the costume, look terrific. The second portrait is full on monster, with the extended jaws and enormous fangs. The eyes and expression are angry and mean, with so much malevolence in the stare. This is a great look for him in the sewer. He's a big dude too, coming in at almost 7 1/2" tall, although you'll probably pose him with a bit of a slouch to his posture. Those areas intended to be clean - edges along the hair, the eyes, the actual red face paint (not the blood), the pom poms - are exactly that, super clean and sharp. This version also has a healthy dollop of blood, both on the face and on the costume, as if he's in the middle of feasting on a tasty morsel. The thicker blood around the teeth does tend to hide the great sculpting, but it's moot since the blood IS the point with this particular release. Perhaps my favorite aspect of this paint job is the eyes, or more specifically, the difference in the pupil size between the two portraits. The pupils look just a little bit bigger on the 'relaxed' face, just slightly dilated, while the angry visage has a more concentrated look thanks to the smaller pupils. There's a lot here, but it's a bit on the wonky side. The neck is not a true ball joint, but more of a simple cut joint. Swapping heads reveals a long post that the head simply sits on - no ball. That means less tilt and lean. The rotating hinge shoulders and wrists combine with pin elbows that have a cut joint right above them, to give you plenty of potential arm poses. The costume is a little restrictive, but it's not terrible. It's more restrictive when it comes to the legs. The hips have less mobility thanks to the poofy bloomers, and while the knees are double pin (separated a bit) and the ankles can move forward and back, the sculpt itself makes deeper and more dynamic stances tough. There's a rocker and cut waist too, but again - the costume doesn't allow for a lot of movement. 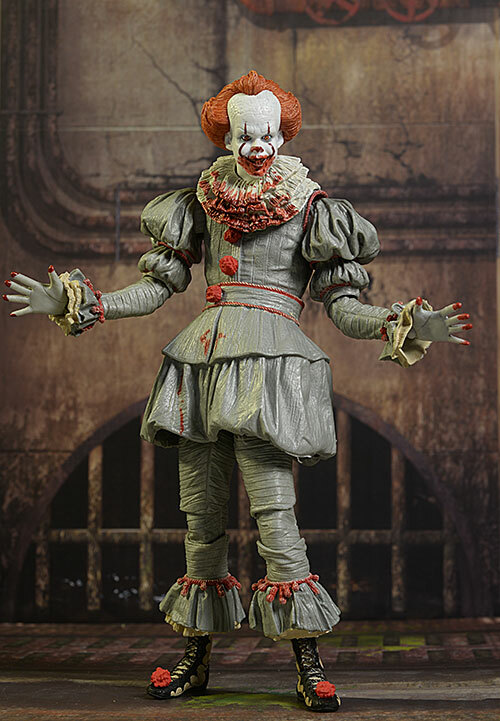 Overall, it's not a bad design, and it does allow for more posability than you might expect - and than we often get with NECA. I've already mentioned that second head sculpt, and they swap pretty easily. But this is an 'ultimate' figure, and that generally means a lot of extras. I think the exclusivity on this one caused them to cut back a little. There is another set of hands, with wide open palms. He comes wearing a right with a wide grip to hold Georgie's arm and a special left with the fingers designed to hold the balloon. Swapping is painless. And yes, he has Georgie's arm and his all important balloon. The arm is severed and bloody, looking as disgusting as you'd expect. The balloon has a white wire for a string, and slides inside a tiny hole between the fingers of the special hand. It looks great in place, and the posable wire is less likely to be damaged or broken. The articulation is better than the old school NECA figures you have on the shelf, and that's part of their new 'ultimate' concept. 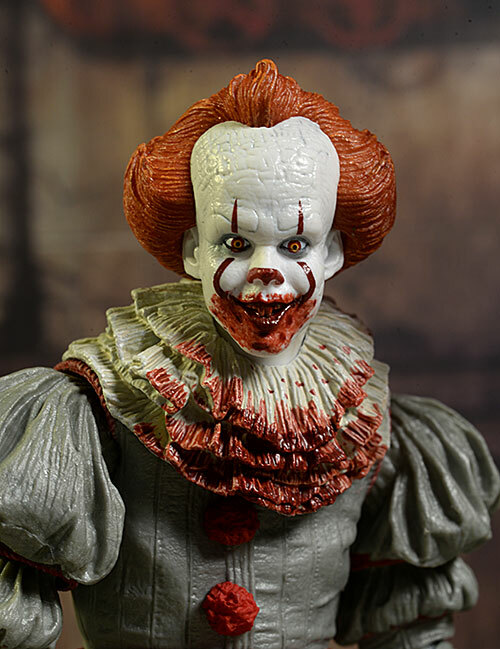 If you could only have one Pennywise from the new film, I'd go with the regular release - you get more goodies and the lack of blood on the relaxed portrait allows you to better appreciate the sculpt - but for the big fans, this guy gives you a really unique look. The regular 'ultimate' version is around $27, which is pretty average for specialty figures in this scale. The exclusivity of this one drives up the price a bit, but compared to other SDCC exclusives, the $35 price tag is pretty much in line. Take your time getting the wire string on the balloon to fit inside the tiny hole in the fingers. It will probably have some paint or a little plastic excess blocking it, but once you get it pushed through, it will move up and down smoothly. Once it's in, I'd leave it in, since the balloon and this hand belong together anyway. NECA has always done fantastic horror movie figures, and their new 'ultimate' series has produced some nice updates to old favorites. 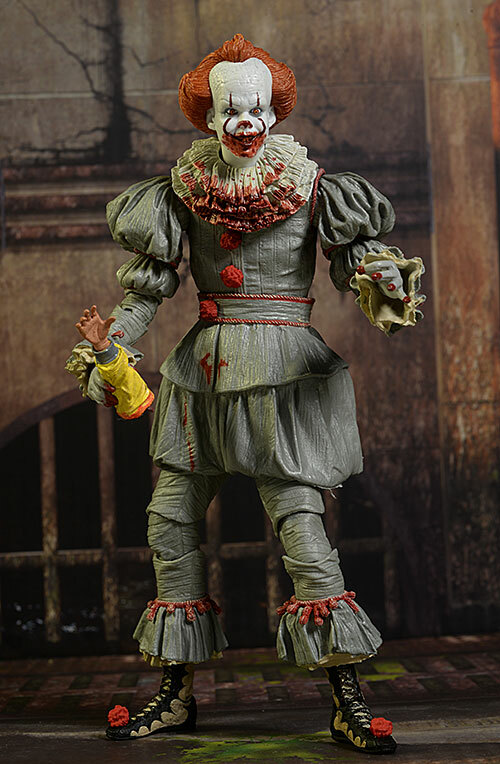 But getting this guy - a new horror character - as part of the line up is a huge plus. 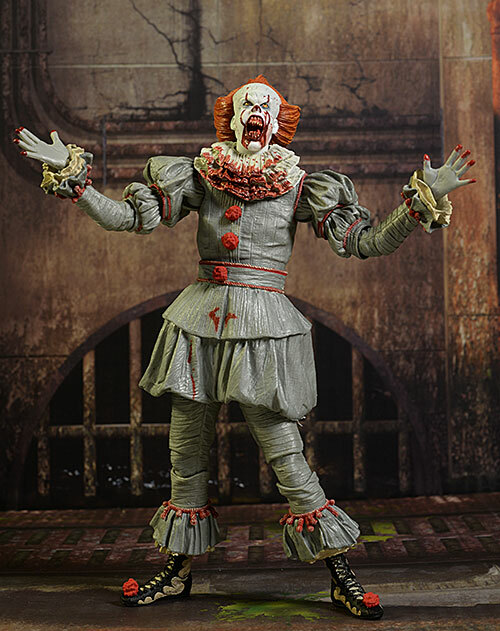 He'll fit in great with your Freddy's, Jason's, and Michael's, and once you have the 1990 version, they'll make excellent bookends on the classic character. That being said, if I could only have one version I'd go with the regular Ultimate rather than this exclusive. This is as it should be, because exclusives should never be the one you really have to have, but rather should be icing on the cake. Get the regular release, and then if it's not enough to feed your hunger, grab this guy too. - has the non-exclusive Ultimate version for $27. - has the non-exclusive Ultimate for $30. - Entertainment Earth has the best price at $26. 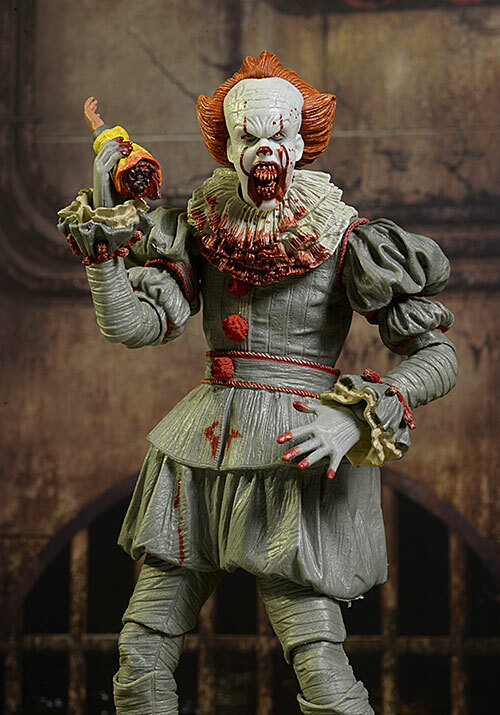 I have the non-exclusive sitting here as well, so I may review that soon, and I'll be checking out the NECA Ultimate version of the 1990 Pennywise soon.